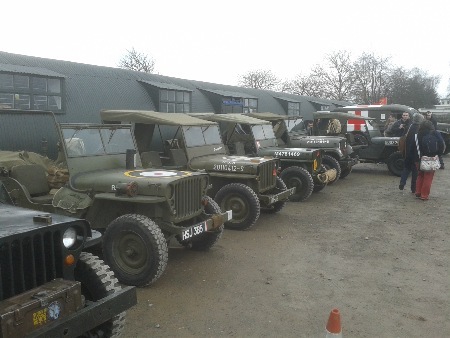 No less than 14 Jeeps and other MVs from the MVT's central areas turned up to help Sywell Aviation Museum open up for the year on Easter Saturday. They were joined by two half-scale examples, one made from Toylander plans and the other scratch built. The opening ceremony included the dedication of a plaque to more than 20 flyers who died during training at Sywell during World War Two. The museum is a voluntary, non-profit-making organisation which aims to preserve the history of Sywell Aerodrome and Northamptonshire's rich aviation heritage from the early days of aviation to the Second World War and beyond. SAM began life in 1998 and the Museum building was opened in 2001 by the late legendary aviator Alex Henshaw MBE who was also the honorary president. Alex flew from Sywell regularly during the Second World War, air-testing Vickers Wellingtons from the aerodrome. The Museum originally consisted of three Nissen huts, dismantled at the now-closed RAF Bentwaters and erected on site at Sywell. The buildings themselves are artefacts having been used as bomb fusing sheds at Bentwaters by the USAAF during WW2. The Museum expanded in 2010 and 2011 by the addition of two new Nissen huts, formerly POW Camp Huts from Snape Farm, Derbyshire. The first hut (opened during Easter 2011) was named The Paul Morgan Hall and houses the Museum's cockpit collection and a complete WW2 Link Trainer. The second hall (opened in Easter 2012) includes an expanded USAAF Hall and a new POW/Luftwaffe exhibition. The Museum's first complete airframe, a Hawker Hunter, was acquired in summer 2012. The museum also contains a Jeep owned by one of the founders and former chairman of the museum, the late Richard Watts, a long-time MVT member. Two half-scale Jeeps. 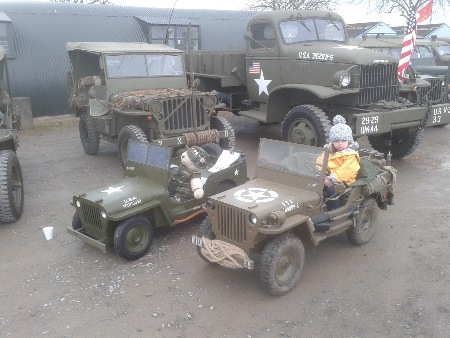 The one nearest the camera was made from Toylander plans and the other, with driver Jeep Ted, was scratch built, with measure- ments taken from the GPW behind it and halved.